As a way to help those few souls who haven't tried their hand at playing Apocalypse sized games of 40k, I enlisted the help of the FTW Blogger Group in putting together some info to get you warmed up to the idea of losing hundreds upon hundreds of points of models in a single shot and having a great time doing so. Looking for all those official GW Apocalypse Datasheets? You can jump directly to the GW page and find them here. Wow...that's probably more info that I'll ever really need, but the Ares definitely has me excited about trying Apocalypse now! Thanks for the links! Otherwise, it's a great post and great idea to put all the Apoc stuff together like this. Nice thing about this was that it gave some structure to what can be a chaotic game, and encouraged teamwork. Marshal Argos: I don't know what could be wrong... they are working for me. 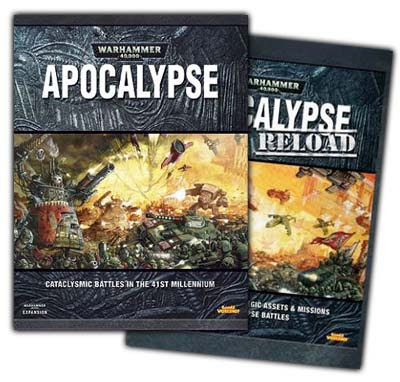 Nonetheless, I will look into it and during the mean time, I've added a link to GW's Apocalypse page so you can hop right over there and get them as well. jabberjabber: Thanks for the link! I'm going to check it out now. Kevin: Don't tell everyone yet... once it comes aout, send me the link and I'll add it here for everyone. Morning, well I don't know what happened last night, but it's working this morning. So no problems anymore. Jabberjabber, great link. I had never seen those before! No problem, that's the approach I'm looking to take with FTW now, promote members and collect some great gaming stuff together in one location for all of us to have access to. While I've not entered the realm of Apocalypse I'll be sure to keep this post in mind for when I do. Thanks. Some how you are always about a week ahead of my schedule. I just got done playing in a massive 40,000+ point apoc game and an working on a post about it. Maybe when I get it done I can get you to update it on to this page. eriochrome: At 40,00 points, you better send the link! This is the photo spread for the Saturday game. This was our second mega points battle. The game was 14 players with ~3K each. Ten players on the main table with 2 side tables with 2 players each. Our first mega point battle was back on the 5th edition release weekend. Luckily the rules were available and pretty well known before the event or 40K points with brand new rules would have been tough. Ive played insanely large games, but that was before all these goodies came out... think I need more friends with large armies!